Need some suggestions for small evening gifts? Here are some ideas so you can join the growing number of globally and socially aware, green consumers willing to pay a premium for top quality gifts which have been ethically made, fairly traded and carry a social benefit for the under privileged. They are "even-ing" gifts: even-ing wealth, even-ing opportunity, even-ing equality. 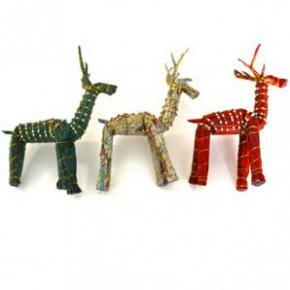 How about a trio of red, white and green recycled newspaper reindeer to add a festive touch for your table or bookshelf? Or, buy a dozen to help decorate the tree? 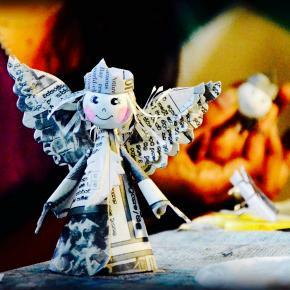 Add a few adorable angels also made of newspaper. They come with a loop attached, ready for the tree or equally sweet sitting beside your nativity scene or the reindeer. Both of these sturdy and thoughtfully made products are environmentally friendly and make a significant social impact for a Sri Lankan community of internally displaced persons, either from refugee status or as victims of the deadly tsunami. How about helping landmine victims? 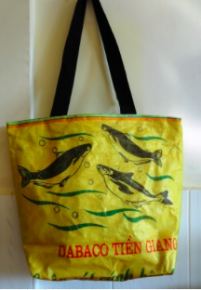 Buy these fun, pastel, and environmentally friendly, recycled rice bag totes, made by a small group of women landmine victims in Cambodia. Available in pink, yellow and green. Funky and bright glasses cases and help women street survivors cooperative. These lined glasses cases are handmade from handloom fabric with kantha embroidery, both sides. Social benefit is children's education and justice services for these marginalized women in India. Bees..... we need our bees for honey for their responsibility for pollinating 1/3 of our food supply. Bees need clean air so why not buy a handloom, handmade bee which is environmentally friendly and part of the SLOW textile movement. The social benefit: smoke free stoves to eliminate the respiratory diseases suffered by so many Mayan women in Guatemala and cleaner air for the BEES. Next blog: ideas for luxury socially-responsible items.